Here is an art gallery online to make purchasing art easier than visiting many art galleries where you can’t possibly see the full range of original art from 30 artists. You can visit the individual artists’ websites to see more of their portfolio through the links Page at the bottom of the Artists’ Profile Page. If an introduction to an artist’s work is made initially through Art Gifted by God, the sale of the artwork will be processed through www.artgiftedbygod.co.uk, not directly with the artist. Buying through the website ensures the World Missions, Charities and Art Projects we support, receive 10% commission from the proceeds of the Sales. 5% will be allocated annually by the World Missions Committee of Christ Church, Cheltenham and 5% by the artists to Art Projects 2015/16. When you buy from us, your painting is packaged and delivered direct from the artist’s studio. All arranged ‘hassle free’ by ourselves. Buying Original Art is supporting an Artist in their endeavours to develop their skills and reputation and providing us with a diverse and fascinating art scene in this Country. Art Gifted by God showcases paintings by reputable, well-established artists as well as giving a platform for emerging talent to sell their work. Every painting bought is helping finance the professional artist or bringing an emerging artist closer to living off their work. The hours spent creating artwork rarely adds up to the money asked for a painting. The money deserved by these artists and achieved in other Arts, but often not in the Visual Arts except for the cream of the crop. When a sale is made, the thrill of reward, affirming an artist’s talent, financing and encouraging future new work can’t be underestimated. There may not be a guarantee that a painting is an investment of the future. Exciting for you, is with a discerning eye, you may see the potential star quality and ‘put your shirt’ on an artist who makes it. Why is Faith through Art important to me? Christian Faith is ‘not in the air’ as it once was. Art exhibitions with themes such as Icons from the Holy Land, Darkness into Light, New Beginnings, War and Peace, Lightness of Spirit, The Presentation in the Temple and Faith through Art, in the Hub Gallery, Christ Church, Cheltenham, has been a way to engage with those people who don’t sit in churches as was once the custom in this country. An audience, not only of art lovers but visitors through the Parish Centre to many clubs and organisations, have found out about our Christian Heritage and the events and teachings in Scripture. In the shows, are not only Christian artists but those who express their love of nature in landscape, who invite you to interpret meaning in abstract image, who celebrate the human in portrait and action, or who challenge us through causes and compassion. “Nikki, art enthusiast and member of Christ Church, has almost single-handedly evolved ‘The Hub’ into ‘The Hub Gallery’. 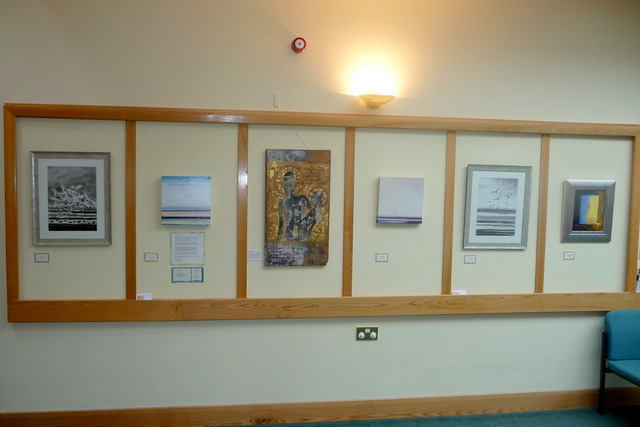 Cheltenham’s artistic community has responded very positively to ‘The Hub’ as a place to show their work. The natural light, allied to the busy footprint through the Parish Centre foyer, has proved a winning combination. It’s thanks to Nikki that Christ Church has twice now had the honour of hosting the launch of ‘Cheltenham Open Studios,” Revd. Tim Mayfield, Christ Church. 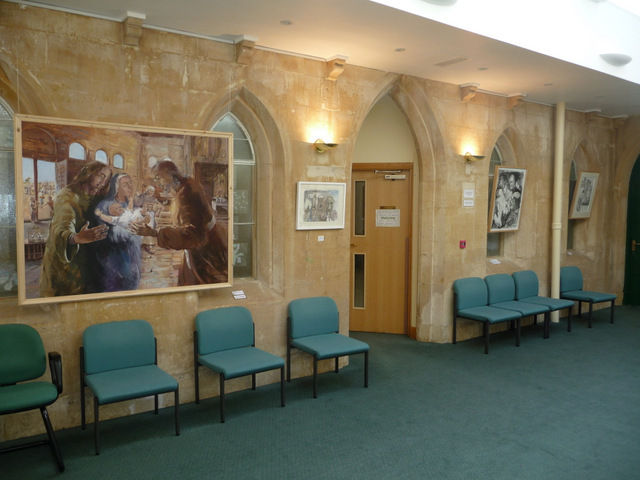 Special thanks go to Christ Church, Cheltenham for trusting me to turn the Parish Centre into the Hub Art Gallery, especially for the support of Revd. Tim and Sue Mayfield, Martin Chapman and artists, Jake and Gillian Lever who were there from the beginning. Cheltenham Open Studios, Cheltenham Group of Artists and Heritage Open Days. Not forgetting the artists, my loving family especially my parents, husband Dave and children Eliza Bernadette (16) and Louis Gabriel (13) who remain ever tolerant of my ever increasing passions for faith and art. Much appreciation and gratitude goes to my Godson, Adam from Fibre Marketing, without whom, there wouldn’t be this cool, clean and contemporary website. “In every generation, the world is changed by a few people, who stand for something, do not fear unpopularity and dare to make a difference,” Nicky Gumbel, Founder of the Alpha Course. 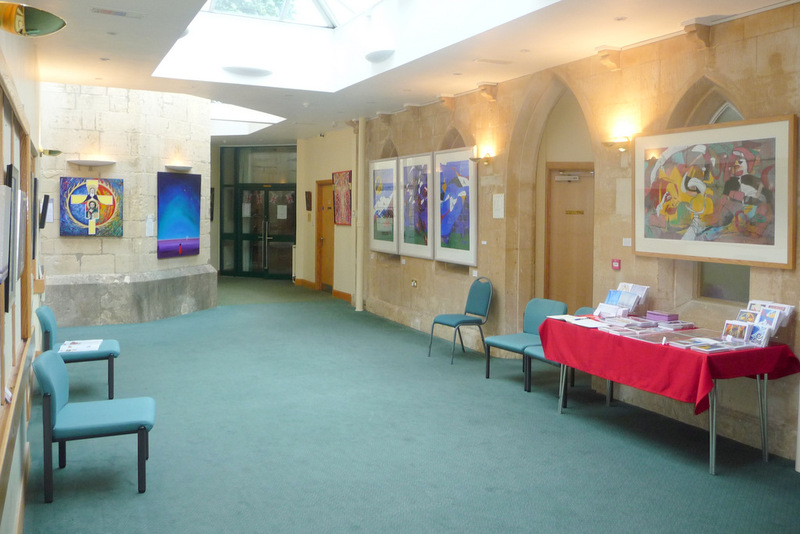 The vision is to bring all the denominations of Cheltenham (40 churches) together through the Arts with event, workshops at the Town Hall, other entertainment/restaurant venues and church spaces featured in one brochure. The Arts include Music, Singing, Dance, Visual Arts, Literature, Comedy, Performance, Film and Children/Youth events. We are sending out a message of our unity – One in Christ and at the same time promoting our immense and glorious diversity. We hope to engage with people, young and old, regardless of their faith, background, race or sexuality. Making young peoples’ involvement a priority – the future of our Faith and Church. We have much to share through our Christian Heritage, our gifts and our faith which continue today to challenge, inspire and transform people’s lives. A New Beginning to be a model for a National Christian Arts Festival every year in April. Presently under discussion is : – A Big Sing Event at the Town Hall, to open the Festival on Sat 9 April, 2016: Getting all the churches and organisations together for a big Songs of Praise-style celebration in the Town Hall …The BRILLIANT news is that David Ogden has agreed to come and lead a huge event like this and is talking in the region of 100 singers and a 50 piece orchestra. The idea is to source singers/musicians ourselves from the town. The Festival will close on Sun 24 Feb at the Town Hall with a Christian Musical Production called Treasure based on the Count of Monty Cristo. Why does ‘Art Gifted by God’ embrace artists of all faiths and no faith ? I see artists gifted by God even if they can’t see the gift in themselves. We are ‘made in the image of God,’ Genesis 1:27, which gives us the potential of immense and unfathomable creativity like our Almighty Creator. Our Heavenly Father has gifted us creativity in our DNA. These artists have an irresistible impulse to create, organise, and fashion. Is their visual art divinely-inspired ? Explore and see what you think. Jesus said ‘I am the way and the truth and the life.’ John 14:6. This is my belief but who am I to say. Others have been brought up as or even more devotionally than me, believing that there are other channels through to the Truth/God. The word Faith is chosen to avoid the word religion because of continuing bad connotations. I don’t think Jesus was advocating that we start a new religion. He wasn’t too enamoured by the religious leaders of his day, that’s for sure. He was asking us simply to learn from his teachings and follow his example of how to live: Faith in Action. “For me, the life of Jesus Christ, the Prince of Peace is an inspiration and an anchor in my life. A role-model of reconciliation and forgiveness, he stretched out his hands in love, acceptance and healing,” as expressed by Her Majesty, The Queen. There are good role models in Christian leadership today, connecting with the wider world, not yelling from rooftops but going about their calling in ways that are unobtrusive and effective. “To have faith isn’t to be blind and blissful: it is to be able to walk in the dark and be confident,” Miroslav Volf, Croatian Protestant Theologian. Sometimes, people are put off choosing a faith because they have experienced injustice, hardship or brokenness in life or because they relate religion to a history of conflict. Despite the bad stuff in my life, some through my own making, I have chosen to stick close to God. Through prayer and learning, I have found a God full of mercy, love and grace – loving kindness even when I didn’t deserve it. I feel instinctively drawn to a God who ‘though I walk through the darkest valley, I will fear no evil, for you are with me,’ Psalm 23:4. I am consistently led to the light and new beginnings. “”Drinking beer is easy. Trashing your hotel room is easy. But being a Christian is a tough call. That’s real rebellion,” Alice Cooper. Nikki Seville took her first baby, Eliza Bernadette, to church 16 years ago because she was the answer to prayer after a history of miscarriages. She hasn’t stopped going to church since. “I lead a home group of some of the ‘beautifully mature’ ladies of the church who have nurtured me as much as me nurturing them. Their wisdom continues to inform and inspire me. During my school days, I used to hide at the back of an art class, self-conscious and inhibited, ‘I can’t do that.’ With a background at the London College of Fashion but no art education as such, an artistic Gift began to emerge when my daughter was born ‘What do you do with a little girl and her friends,’ I considered. 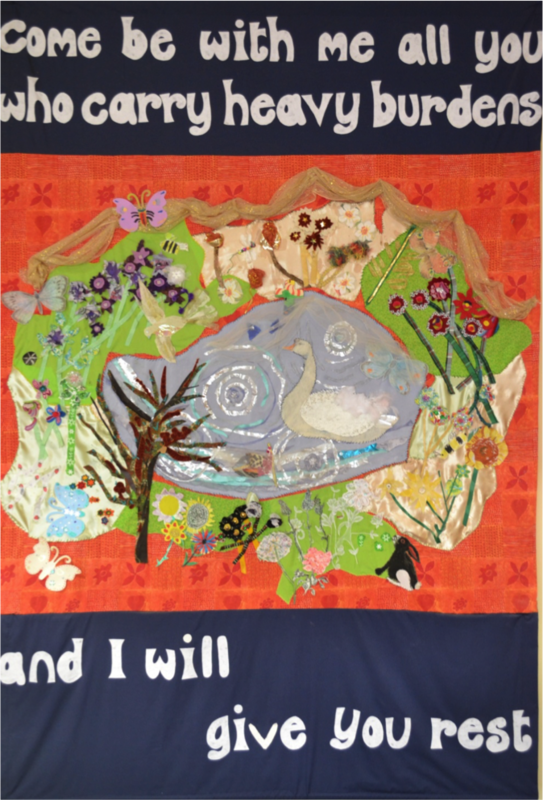 ‘I know – you draw, paint and make things.’ I love doing large wall hangings collaboratively with groups especially children. I believe God leads me and speaks through my artwork. Contemporary faith and miracle stories, prophesy and scripture in mixed media. Many of my ‘faith through art’ friends share this sense of the Hand of God helping them.My home has been turned into a gallery giving people the opportunity to see what a painting can look like in the home-setting placed round the kitchen table at eye- level, next to an open fire or alongside the microwave in the kitchen! A London College of Fashion training sharpened my eye to design and commerciality. 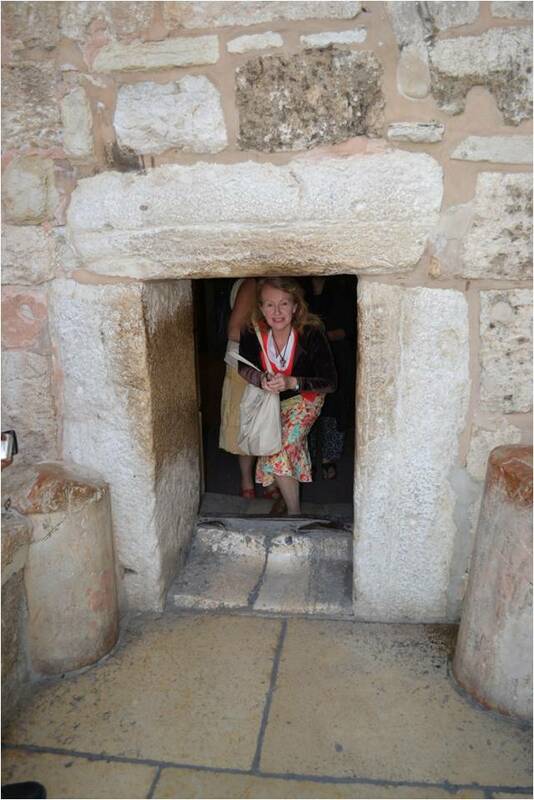 A career path including selling beautiful houses in the Cotswolds for Jackson-Stops & Staff and owning Dormer Chemise, designer clothes shop in Painswick along with helping to organise Cheltenham Open Studios, Heritage Open Days, and now as Project Manager of Christian Arts Festival Cheltenham 2016. 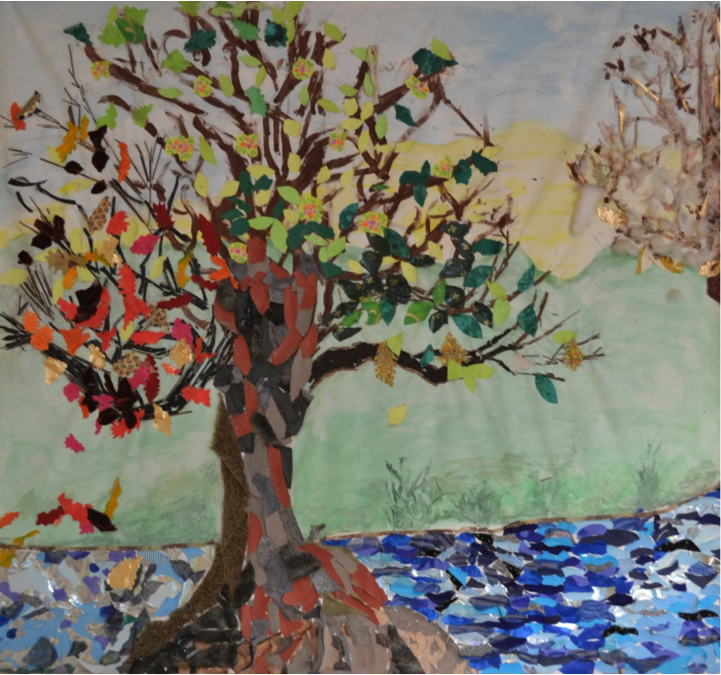 I also love running craft clubs for children and art clubs for promising new artists, I have always kept close up and personal to ripples which cause waves that keep the aesthetic world alive and kicking.